There’s only one 2018 Toyota 4Runner. 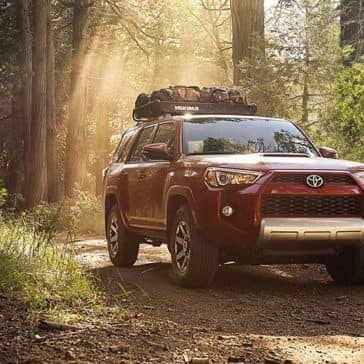 With the competition becoming increasingly interchangeable and predictably lackluster, Toyota’s SUV stands out with body-on-frame construction, solid axle, and a focus on aggressive off-road capability, though it still embraces the latest technology and comfort features. 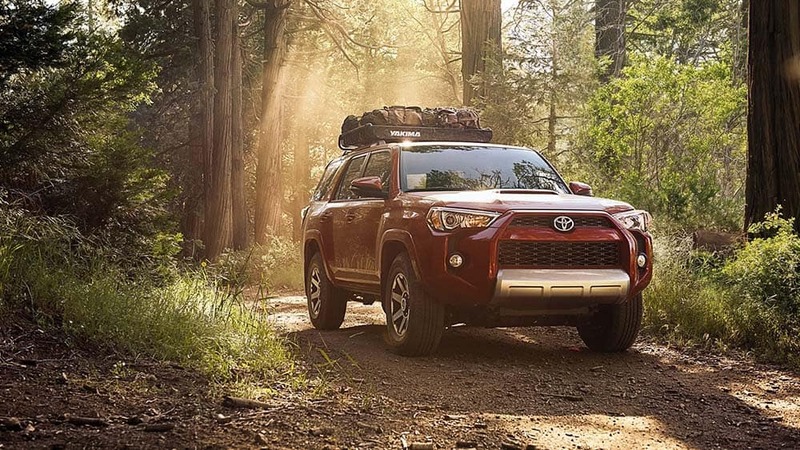 It’s a model that means what SUVs did ten years ago rather than what they suggest today – for those who feel the segment has been softened, the Toyota 4Runner will appeal. 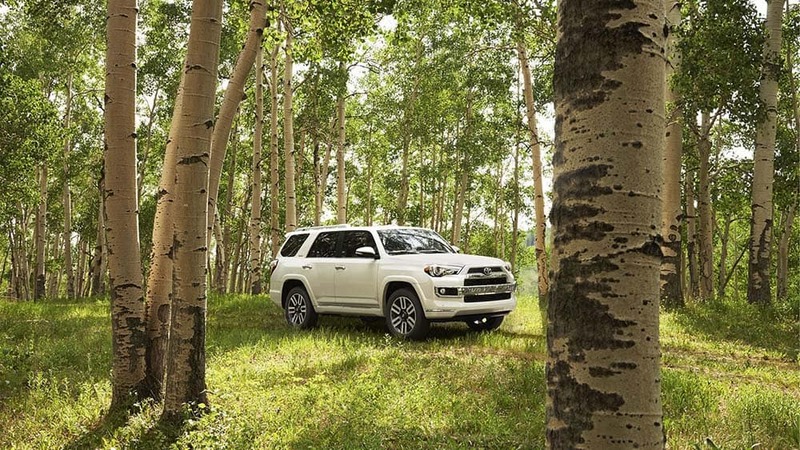 You can contact us today to find out more and explore incentives, but make sure you check out the 4Runner first. The drive from Streamwood to Chicago and back just got a whole lot better. 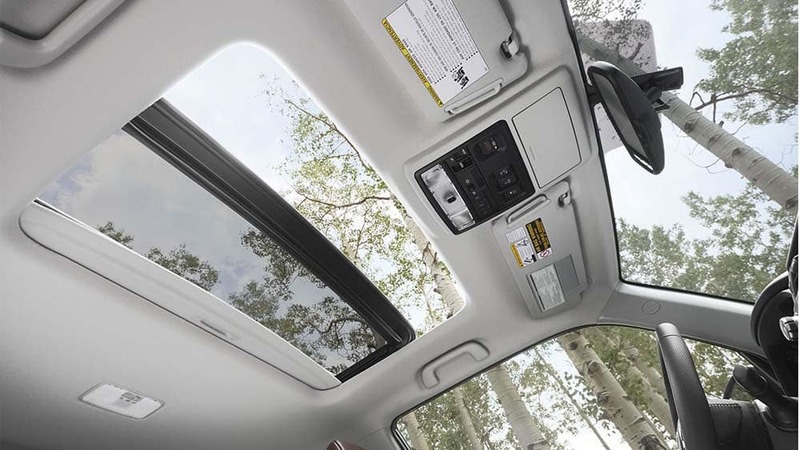 Visit Elmhurst Toyota and let us make it better for you. 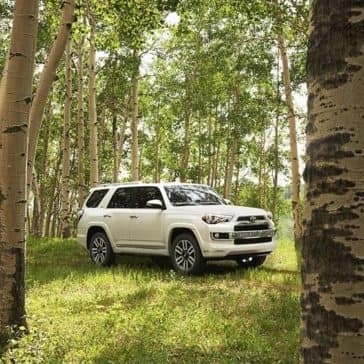 The 2018 Toyota 4Runner is one of the last SUVs to retain body-on-frame construction that Streamwood Toyota drivers demand. 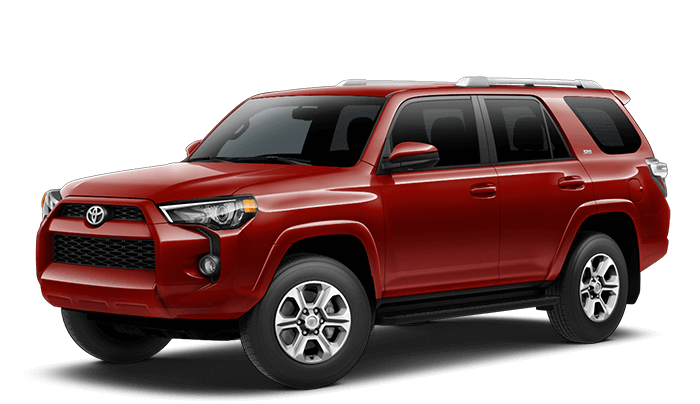 While others court the soccer mom demographic, the 4Runner remains the last bastion of rugged capability. 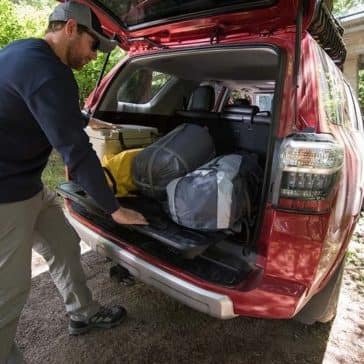 It’s why 90% of 4Runners sold over the last 10 years are still on the road, even after powering through treacherous weather and taxing terrain. Fittingly enough, there’s no messing around when it comes to power. 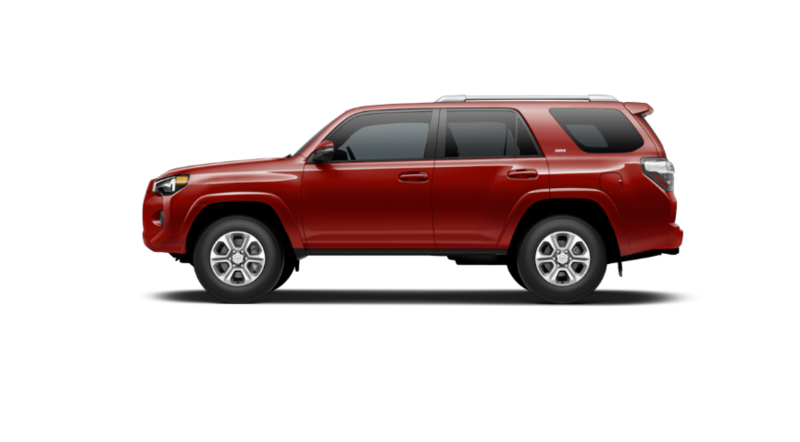 Streamwood Toyota drivers won’t find an ‘entry-level four-cylinder’ here – all models command a 4.0L V6 for up to 270 hp and an impressive 278 lb-ft of torque. That’s enough to sprint past lesser models on the highway or tow up to 5,000 lbs. behind you. But this is really a vehicle that yearns for the backcountry. 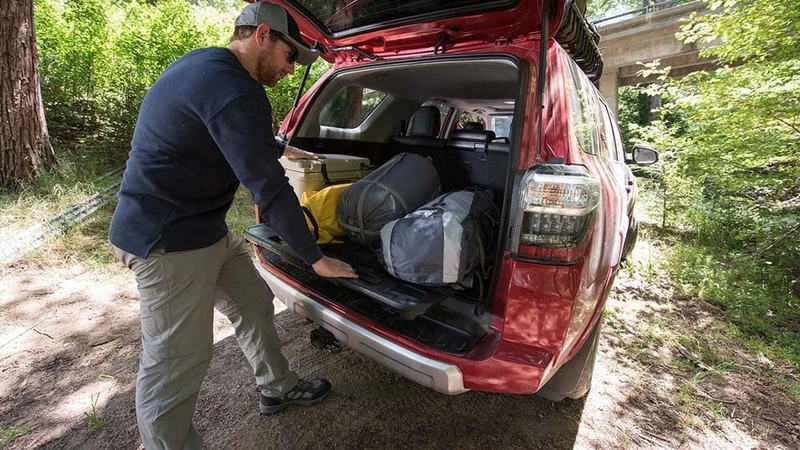 Part-time or full-time 4WD with Active Traction Control is available according to your needs, plus a Kinetic Dynamic Suspension System (KDSS) with Crawl Control for optimal traction and faultless articulation. TRD Bilstein High Performance Shocks with TRD-Tuned Springs: Carries you over testing terrain without loss of control. ¼-inch Thick Aluminum Skid Plate: Protects your front end against everything from rock to mud. 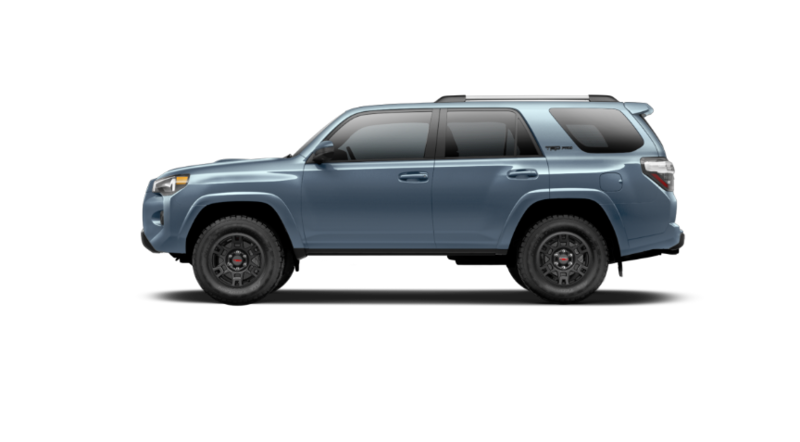 17-Inch Matte-Black TRD Wheels with Special All-Terrain Tires: Finely engineered for crawling across rock, dirt, and mud. 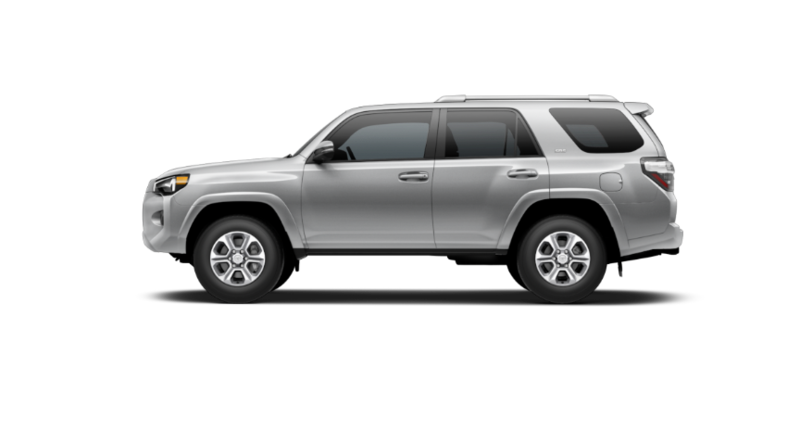 The 2018 Toyota 4Runner can accommodate up to seven in comfort, and 40/20/20-split seats allow for surprising versatility. 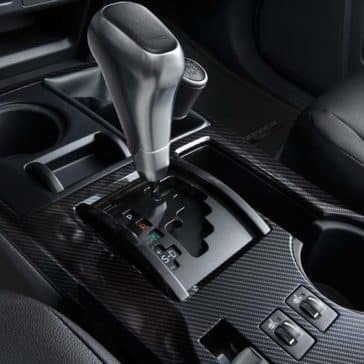 After settling into the lavish cabin for that Streamwood to Chicago drive, you’ll find first-rate technology at your fingertips. Eight Speaker Sound System with Auxiliary Audio Jack, USB port, and iPod® connectivity. Available upgrades include Entune App Suite, which lets you use apps such as Facebook Places, Yelp®, iHeartRadio, MovieTickets.com, and Pandora through your touchscreen, and a Premium JBL® Audio system with 15 JBL® GreenEdge™ speakers, subwoofer, and amplifier. 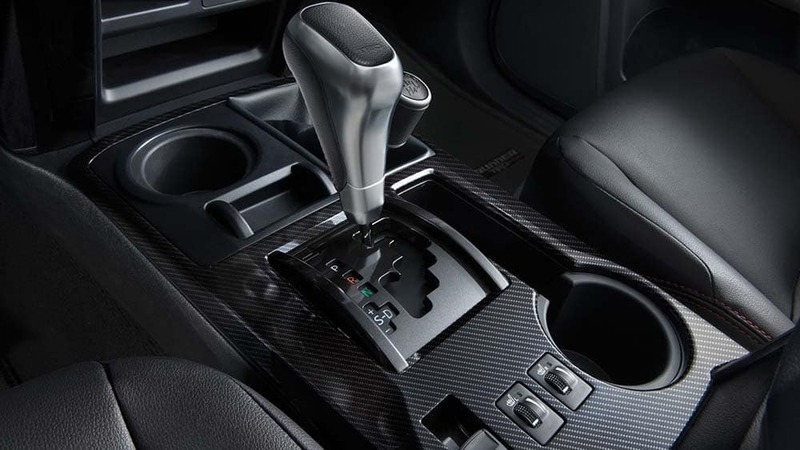 The drive from Streamwood to the city is typically a safe one for the most part but in the unlikely event of a collision, the vehicle instantly leaps into action to keep you and your passengers from harm. 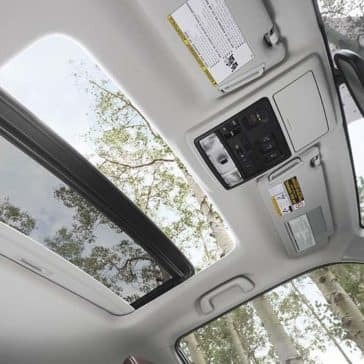 An Advanced Airbag System, active front headrests, 3-point seatbelts, and LATCH (Lower Anchors and Tethers for Children) system help prevent injury. Safety Connect offers Emergency Assistance, Roadside Assistance, and Automatic Collision Notification. Should you require assistance, the relevant authority will be alerted and sent to your destination as quickly as possible. 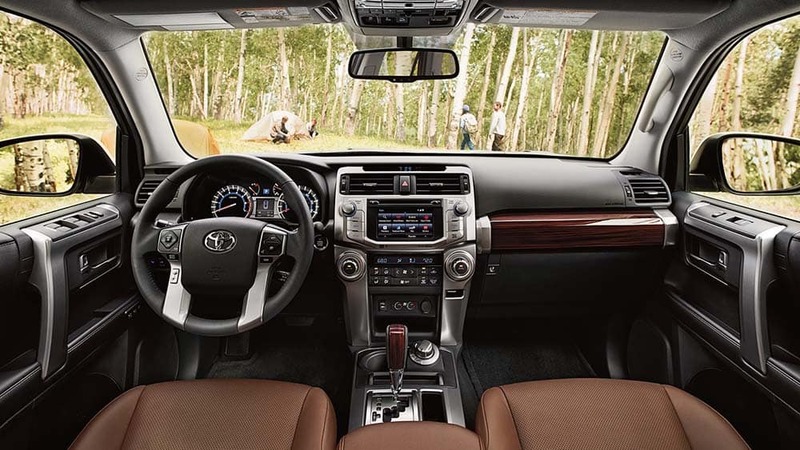 SR5: Shunning the notion that entry-level equals basic, the SR5 includes a rearview camera, power liftgate, keyless entry, and a 6.1-inch touchscreen entertainment system with eight speakers, USB port, and satellite radio. 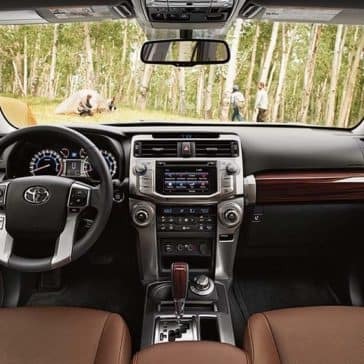 SR5 Premium: The Premium variant upgrades with power-adjustable heated mirrors, upgraded upholstery, heated front seats, auto-dimming rearview mirror, and navigation. 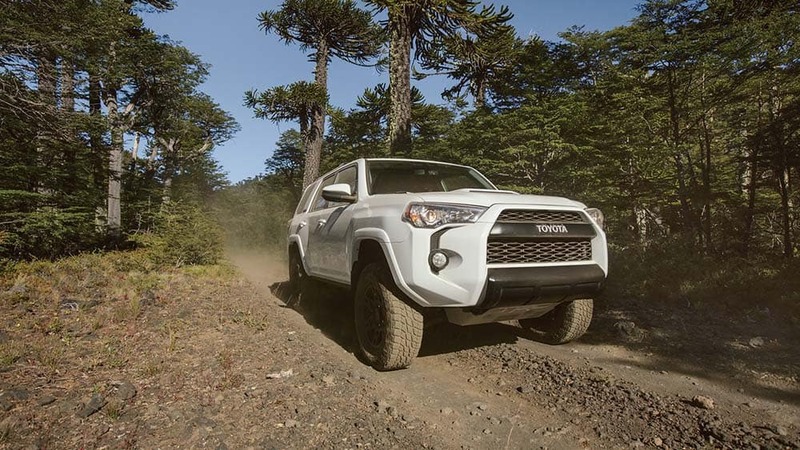 TRD Off-Road: With crawl control, wider wheels, and locking rear differential, this is one made for the trail. It even flaunts fetching TRD badging. 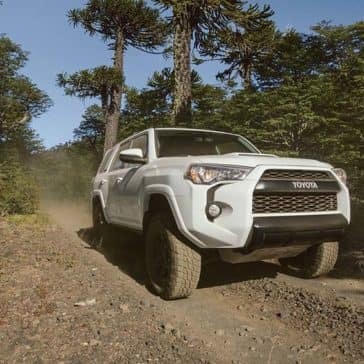 TRD Off-Road Premium: Enticed by the features of the SR5 Premium and the off-roading ability of the TRD Off-Road? 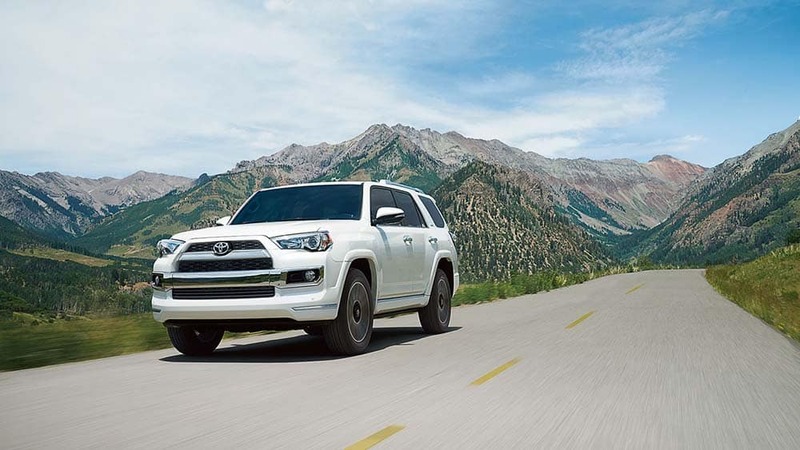 They come together in the TRD Off-Road Premium. 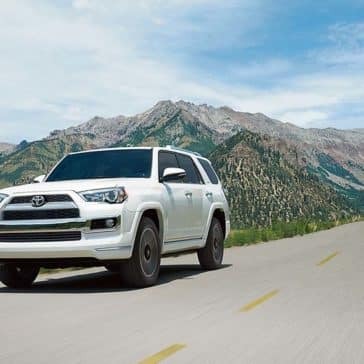 TRD Pro: To head where others fear to tread, the TRD Pro complements TRD Off-Road features with Bilstein dampers with TRD-tuned springs, special all-terrain tires, and TRD-stamped aluminum front skid plate. Limited: Bringing the Toyota 4Runner brand into the luxury segment, the Limited trim includes 20-inch wheels, dual-zone climate control, 15-speaker JBL audio system, front and rear parking sensors, heated and ventilated front seats, and leather upholstery. Lease a new 2018 4Runner Premium for $329 a month for 36 months with $3548 due at signing, which includes first month’s payment, $2898 down payment, $0 security deposit and $650 acquisition fee. Does not include, taxes, license, title fees, insurance and dealer charges. Closed-end lease. Example based on model #8666 with FE MR PT QD 2T C7. Total Manufacturer’s Suggested Retail Price $39814. Monthly payments of $329 total $11844. Capitalized cost of $38440 based on down payment and dealer participation, which may vary by dealer. Payment may vary depending on model, equipment choice, and final transaction price. Lease-end purchase option is $27471. Customer responsible for maintenance, excess wear and tear and $.15 per mile over 12,000 miles per year. To qualified Tier 1+ customers through Toyota Financial Services. $350 disposition fee due at lease end unless customer purchases vehicle or decides to re-finance through Toyota Financial Services. Subject to availability. See participating dealer for details. Offer ends 01-31-2018. Does not include College Grad or Military Rebate. ToyotaCare covers normal factory scheduled service for 2 years or 25,000 miles, whichever comes first. See Toyota dealer for details and exclusions. Valid only in the continental U.S. and Alaska.